More than 5 months ago I decided to place for the first time at disposal of the public at large one of the most important GUNNER24 Forecasts. 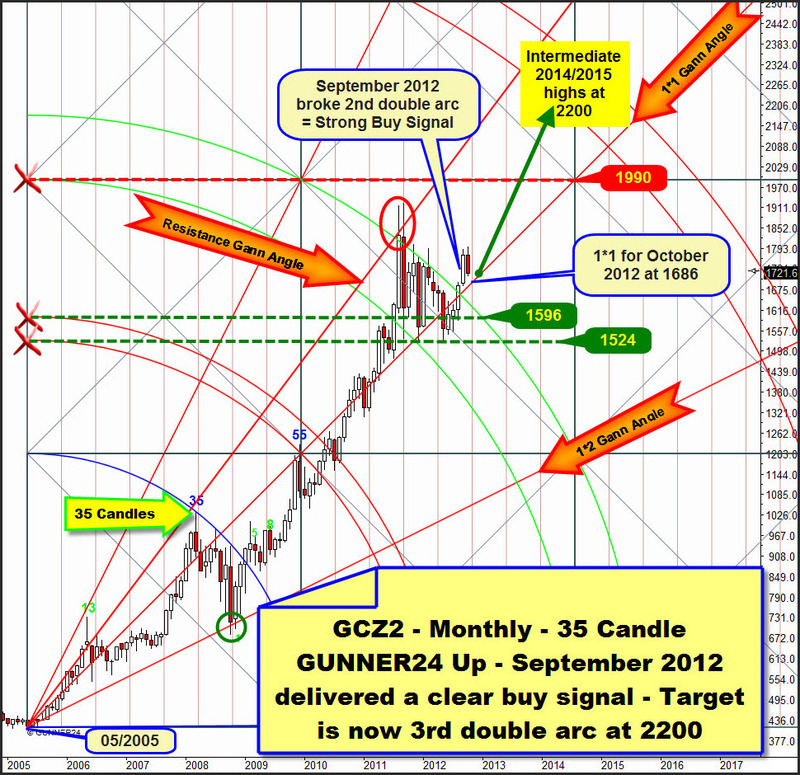 Under the headline "Gold cycles into 2019 Bull Market Top" in May 2012 I published this long-term forecast on gold. 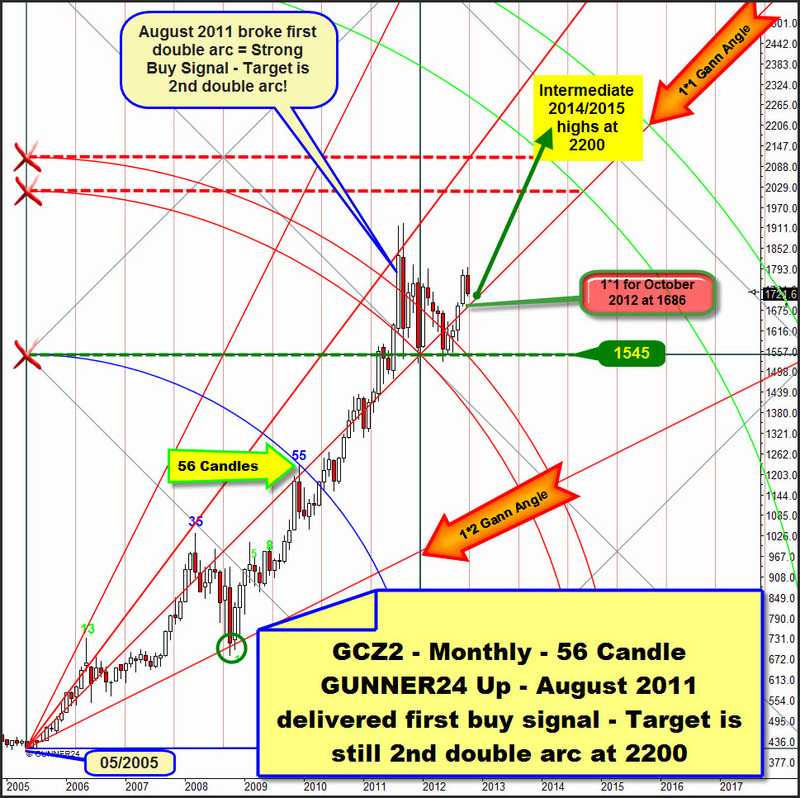 The analysis considered the period of the gold performance from 1999 to May 2012 and the important thus arising GUNNER24 Up Setups on monthly basis that facilitated the forecast of the gold performance through the year 2019 and further on. With the May 2005 lows the actually dominating up cycle initiated whose starting impulse is proceeding in an extremely classical way. There’s a small 13 candle initial impulse and another impulse lasting 35 months that is orienting by an additional Fibonacci number almost perfectly as well as the highest measurable Fibonacci impulse so far, the 35+21=56 one. You know, the Fibonacci series is inter alia …8, 13, 21, 34, 55, 89, and so on. The 13 candle impulse reached its main target in August and September 2011. The 5th double arc is frequently the trigger of a larger correction. It’s really classical that the all-time high is happening exactly on an important time line. We know that at the important time lines very often important highs or lows are marked. Significant turns are the result. The first touches with the main target led to an extended correction that went down until the strong horizontal support area of 1557-1500. Starting from this support area by the September 2012 candle gold achieved a first closing price within the lines of the 5th double arc. Closing prices in a double arc use to prepare the final break of this double arc. So in this up setup gold is approaching another significant buy signal. 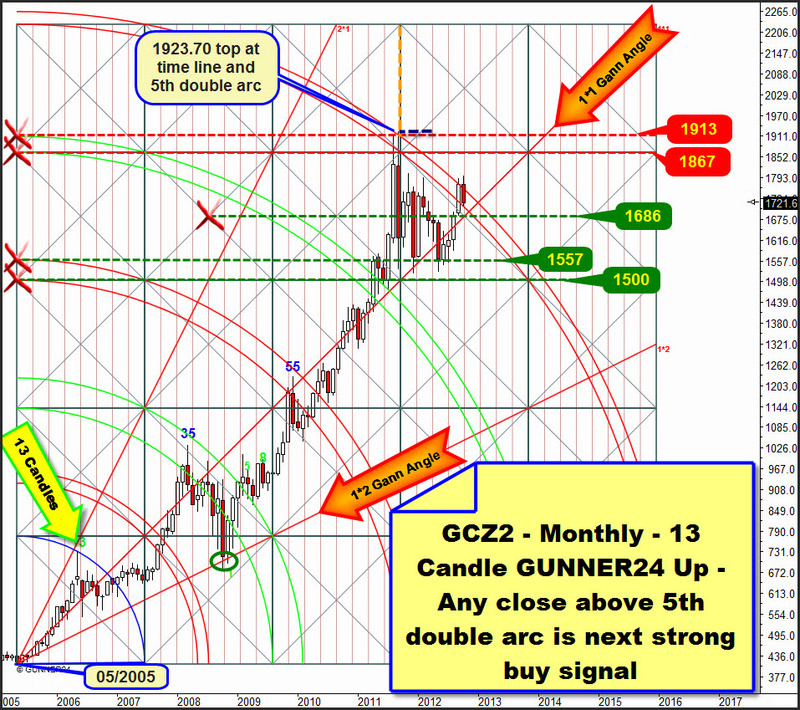 Each October close above 1780 would be another strong monthly buy signal for gold. 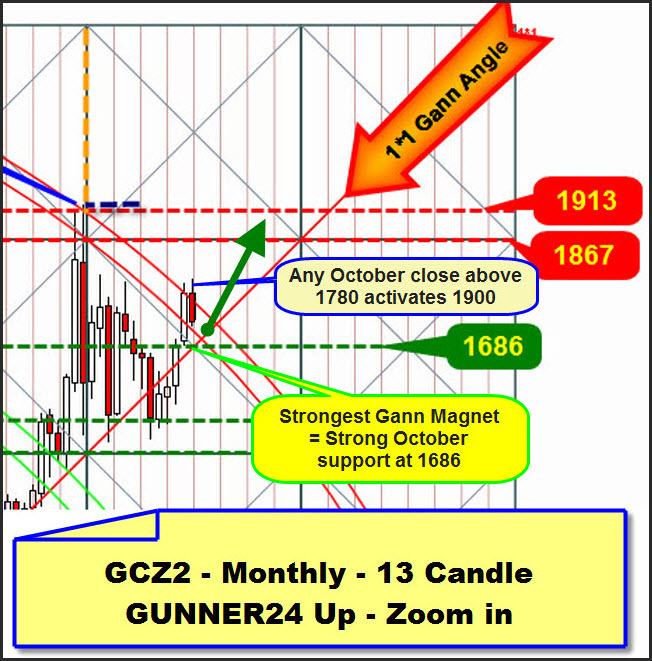 Zooming into the chart we can better recognize why a touch with the Gann magnet that passes at 1686 for October 2012 might be the strongest attraction point of the actual October correction on weekly and daily basis. With the Friday close gold is now trading within the lines of the 5th double arc. Now the correction may end any time because the support function of this 5th double arc and especially of the lower line of the 5th might start off at any moment. Even seen through the darkest bearish glasses, the actual correction is but a matter of an extended test of this 5th double arc. In case of a significant close below the 1715 mark (lower line of the 5th) this test indeed may go down to the strongest visible magnet – the 1686 (intersection point of the 1*1 angle with the horizontal support of the just passed square) – but that’s where it’s supposed to end. I.e. neither in October nor in November gold is supposed to close significantly below 1680. From the 1680 environment gold shall turn up again breaking the 1755 on closing price basis upwards significantly and subsequently heading for the next existing up targets of the 13 candle setup. And that’s the region of the all-time highs – spring 2013! In the 35 candle setup we recognize that the market newly reached the lower horizontal support at 1524 in May 2012 turning upwards from there and breaking subsequently the 2nd double arc again in August 2012. The August 2011 candle had likewise closed narrowly above the 2nd suggesting a slight buy signal. The absolutely final long-signal was switched on by the significant break of the 2nd double arc in September 2012. Thus the intermediate highs until 2014/2015 at the 3rd double arc are now activated conclusively and finally. Price target till then are now for pretty sure (more than a 70% of probability) the 2200. It’s moreover interesting to note that the last correction of the all-time highs proceeded very well-ordered within the 2nd double arc. Certainly the months joined the 2nd downwards, but since the candles largely were within the upper and the lower lines the correction was "orderly" and with hindsight limited somehow… because just the support function of the 2nd was giving the note (technically the green double arcs always give strong support after being reached…), because it was backing the market not being able to permit any different outcome but a "little orderly correction". The upper line of the first square is defining the absolutely most important support: 1545. About that please pay also attention to all these green dotted GUNNER24 Horizontal Supports in the 13 and the 35 monthly ups that also pass around the 1545 support. As well as so far the sphere between 1596 and down to 1500$ is a greatly strong support area. This sphere is where the last correction came to an end. Regarding the first double arc this correction proceeded very well-ordered also in this setup… It was an extended test of the first that came to a final end with the re-break of the 1*1 Gann Angle in August 2012. With this1*1 re-break gold is in the right track again. In the course of the next 2.5 years it is going to rise along the 1*1 angle till the 2nd double arc will be reached. After reaching the 2nd double arc in this setup, the next "big correction" in the actual up-cycle will start.